Das Ferienhaus Villa Beyond liegt an einem Hügel in Bangtao und ist eine exklusive Adresse mit Blick über die kristallklare Andamanensee und die umliegende Natur. Zum Strand von Surin und den Orten Patong und Kamala sind es nur wenige Minuten. Das Ferienhaus ist mit 7 Schlafzimmern ausgestattet. Die Hauptsuite besitzt ein breites Doppelbett, ein eigenes, angrenzendes Badezimmer mit Badewanne und Whirlpool mit Meerblick sowie einen Balkon. Schlafzimmer Nr. 2 und 3 sind jeweils mit einem breiten Doppelbett, einem eigenen, angrenzenden Badezimmer sowie einem privaten Balkon ausgestattet. Schlafzimmer Nr. 4, 5 und 6 haben ein breites Doppelbett und ein eigenes, angrenzendes Badezimmer. Schlafzimmer Nr. 7 ist mit einem Doppelbett sowie einem eigenen, angrenzenden Badezimmer ausgestattet und bietet Zugang zu einer privaten Rasenfläche und einer Terrasse mit spektakulärem Ausblick. Das Design des Ferienhauses ist sehr ansprechend und weckt Interesse bei den Gästen. Der Wohnbereich bietet direkten Zugang zu dem atemberaubenden Infinity-Pool sowie eine herrliche Aussicht. Die Gäste können zwischen verschiedenen Mahlzeiten, die der hauseigene Koch zubereitet, auswählen. Die Essensbereiche im Innen- und Außenbereich bieten Platz für jeweils 12 Gäste. Das Ferienhaus besitzt einen Massageraum mit vier Massagebetten. Dieser kann auch als Kinderschlafzimmer genutzt werden. I am very satisfied with this villa! I spent 5 days in this villa with my extended family, a total of 13 persons including a 2 year-old kid. The staff was helpful, the rooms spacious, the food delicious and the pool entertaining! The only down-side is the location. It is located on top of a hill at Bang Tao area which means that you need to have some form of transportation to go to areas that you want to visit. 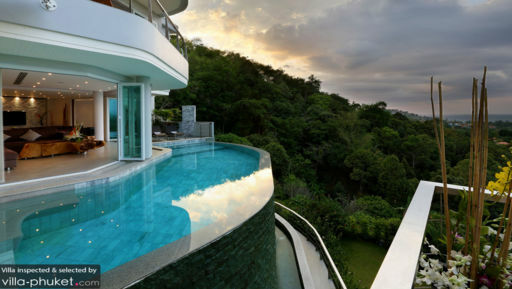 Perfection.. thats the word for this villa. The villa, views, location and service surpassed all expectations we had. Came here with my family of 10 and left with the experience of a lifetime. Absolutely perfect, the building, service, food, everything. I cannot rate highly enough. I will be back. 15 of us stayed here for my wife's 30th birthday (they put an extra bed in the spa room). The experience was beyond all expectations. The place is huge, incredibly stylish and kitted out with every mod-con. We felt like we were on mtv cribs! All bedrooms were large and the music system connected to every room as desired. Huge comfortable beds and high end bathrooms throughout the property. Kuhn Oi and her team were very accommodating. Always there when you needed but unobtrusive. The kitchen, lounge and swimming pool area were all open plan allowing the party to easily socialise whilst enjoying there own comforts. Trip to the beach and a night out were easily arranged. Vegetarian food was accommodated easily with a set dinner and BBQ lunch. We took our own alcohol and found the food cost to be fair and reasonable. My wife and all her friends had the time of their lives! We stayed here for three days and the only regret is we didn't stay longer. I believe the photo of the villa already show you how good is this property, and their service are on the same standard. 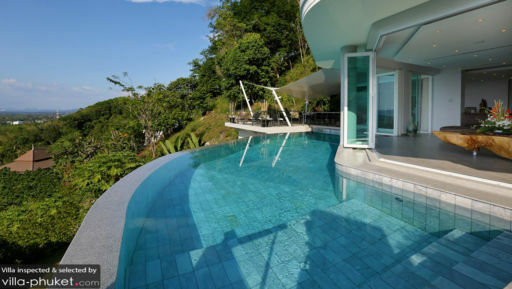 This villa is located on the hill, which provides you great view and the quietness. But don't worry about the convenience, the manager Ms. Oi and her team will arrange everything for you in this villa. In villa meals, massage are all in reasonable price. Also the staff will give you best offer for any day-tour you intended to join. It was an incredible experience and we can't wait to come back! Our family (12 of us ranging in age from 2 yrs to 69 yrs) assembled from both hemispheres of the globe at villa beyond for what was meant to be a relaxed, comfortable reunion come celebration of our dad's 70th birthday. It turned out to be a luxurious, pampered dream holiday thanks to the staff who made the property even more appealing with their attentiveness and super-efficient nature. At the same time they were so discreet it was almost magical how they appeared whenever they were needed and yet were not at all in our way. The chef produced very tasty and yet (surprisingly) most reasonably priced dishes. A couple of maintenance issues were attended to with haste. 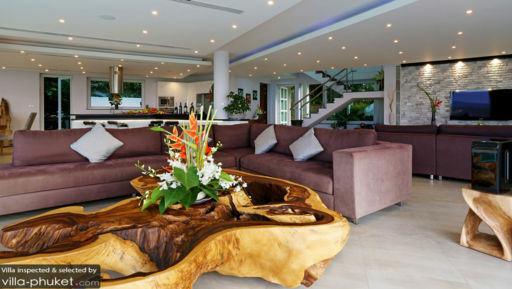 The Villa concierge Oi was an absolute professional..... made sure our every whim was catered to, and suggesting alternatives when we were deciding our itinerary. Even took care of a nasty taxi driver (who we had arranged on our own on the first couple of days)..... We quickly learnt our lesson and asked her to arrange any other transport that we needed. Probably the only downside to the whole property is the steep sloping access road to get to it.... Well documented by the Villa managers when corresponding with them so not a surprise.... But some 13 seater vans (less powerful ones) may have a problem climbing the slope (hence the reason for the nasty taxi driver mentioned earlier) and so may refuse to take you right up. Overall it was a truly magical experience and the photos on the website are no exaggeration! What can we say in the end (opinion of all 20 people): - amazing quality villa; - very private and beautiful location; - great decoration with comfort; - AMAZING TEAM, exceptional SERVICE, very nice and FRIENDLY STAFF, so helpful!!! Service is out of any expectations! - breathtaking view! Minuses only are: - a bit far from fun area (but villa easily organized transportation for us); - some insects (cause next to forest and a lot if light) - but in general is ok. Would recommend for bi parties like weddings, birthdays. But at the same time can be great family vacations. We were friends from 4 different countries between 26 and 31 yo. All been to many places in the world. But this villa made a big mark in our memories for sure!!! Highly recommend! And price is really affordable for big groups of people! About Villa It is as it states on its website with no exaggeration. Our family of 9 adults 1 child and 1 infant, all enjoyed our stay and recommend it to others. Accommodations Each room is as it states, however, only 1 room was able to watch TV (aside from the living room). Yes, it does have that many movies and a good sound system to accompany the HD films. Surrounding Environment Was great with spacious panoramic views and the pool was used every day including night and rain (kids loved it: but requires supervision) Transportation at night and on rain days were a little difficult due to the steepness of the hill. Elderly and people with heart issues are not recommended to walk up or down this hill. Service Was 110%. Cooking, cleaning and friendliness was better than most 5 star hotels. The in-house cooking is recommended. Overall We would come back. Amazing Amazing Amazing. This was our comments since our first steps into the villa and it remains until the very last day. We (a group of 13) stayed at this villa for 7 days, and it gave a lot of great memories to our group. The staffs are VERY welcoming, and very flexible on supporting our requests on anytime during the day. They were so accomodating to our daily activities and habits, that we do not feel disturbed at anytime during the day, yet they can still complete their cleaning up routines! The lovely lady chef was the best, I think we each gained about 10kg from this trip simply because the foods made were so good!! You can basically order ANYTHING, on or not on the menu, and she can manage to cook for you. the villa was beautiful just like seen on pictures, though some of the facilities / walls can do some updates, but those are really minor which don't really affect the overall rating. Strongly recommend this villa to anyone who is looking for a true escape!